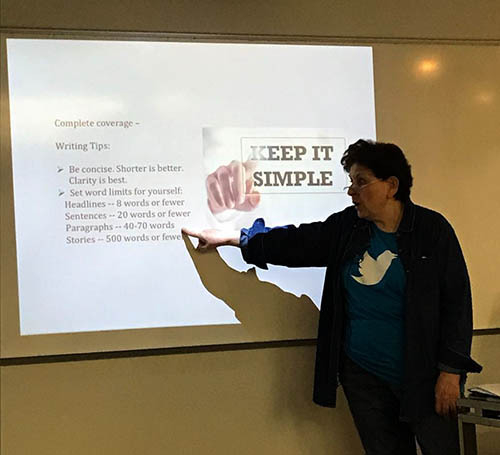 A two-day strategic communications workshop helped staffers at the Lebanese American University (LAU) beef up their writing and editing skills by thinking like journalists. Media Unlimited director Magda Abu-Fadil put members of the Marketing and Communications (Marcom) team through the paces of researching, reporting, editing, visualizing and engaging through social media in August 2018 to boost the LAU brand across multiple platforms. She created a newsroom environment simulating fieldwork that requires on-the-scene reporting, shooting pictures and videos, and interacting with newsmakers in their academic world. The intense sessions focused on what skills journalists need to operate in a digital-first environment where search engine and social media optimization can determine what news attracts the requisite attention. 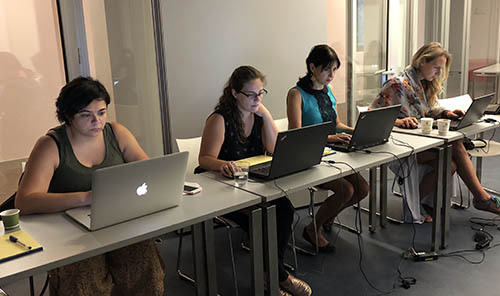 The workshop examined the very essence of news and its sources, the key to writing strong leads, fine-tuning quotations, and using contextual details to bolster elements of a story. Abu-Fadil dedicated a session to media ethics, the need to be mindful of proper sourcing, and how to avoid the dissemination of mis- or disinformation. Each session included exercises and quizzes to test participants’ grasp of the topics. The Marcom staffers also learned how to hone their headline writing skills by using action verbs, word association, quotes from stories, substituting words with punctuation marks, ensuring the story title leads readers into the main text, and optimizing it for search engines and social media. Abu-Fadil gave trainees a general knowledge quiz, cautioned them about oxymorons, and refreshed their memories on the importance of correct grammar and punctuation, with case studies of common errors as well as good writing examples. Given Marcom’s mandate, participants also worked on the public relations aspect of communication by improving their writing of news releases and how best to pitch stories to various media. The MU director helped the trainees better craft their coverage of speeches, meetings, and news conferences. She also provided tips on how to write solid feature stories. LAU’s campuses in Beirut and Byblos provide an ample supply of events and people to highlight. 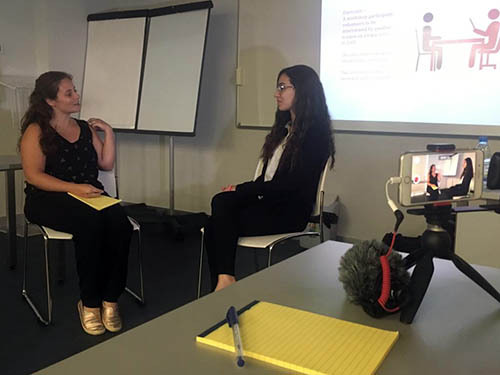 An important part of the training included mock TV interviews with staffers acting as reporter and interviewee while Abu-Fadil shot sequences that were later evaluated for strengths and weaknesses. 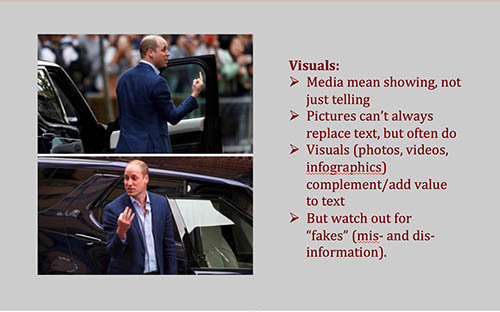 Equally vital is the use of visual elements like photos, videos, infographics, and illustrations. Trainees sharpened their caption-writing abilities and learned how to turn photo captions into mini-stories. 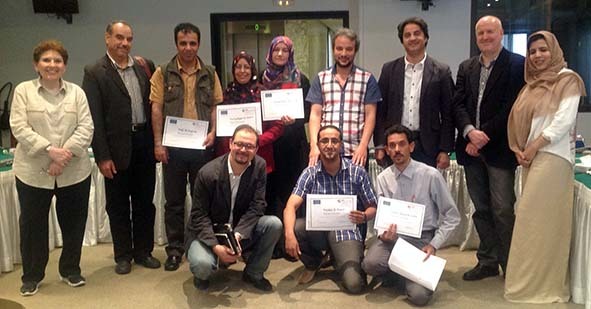 Media Unlimited director Magda Abu-Fadil helped eight Libyan journalists better understand solid reporting in a final workshop to assess their coverage of European Union-related issues. She joined BBC veteran Russell Peasgood to train the reporters from Tripoli, Benghazi and Ajdabia. 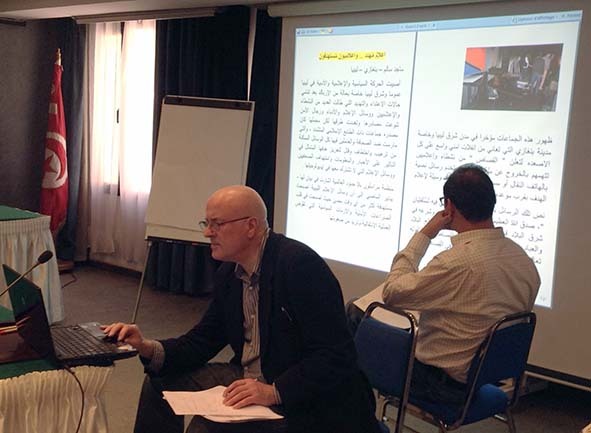 The training took place in Tunisia due to the unsettled situation in Libya. Government security forces, opposing warring factions and militias systematically target Libyan journalists. The journalists’ work for the course reflected the threats under which they operate. Abu-Fadil stressed the importance of writing strong leads, avoiding opinions in hard news reports, verifying all information, using proper attribution, and being mindful of media ethics. Media Unlimited director Magda Abu-Fadil contributed to a UNESCO publication on elections coverage that featured the media’s mixed bag reporting of Lebanon’s presidential, parliamentary and municipal balloting. 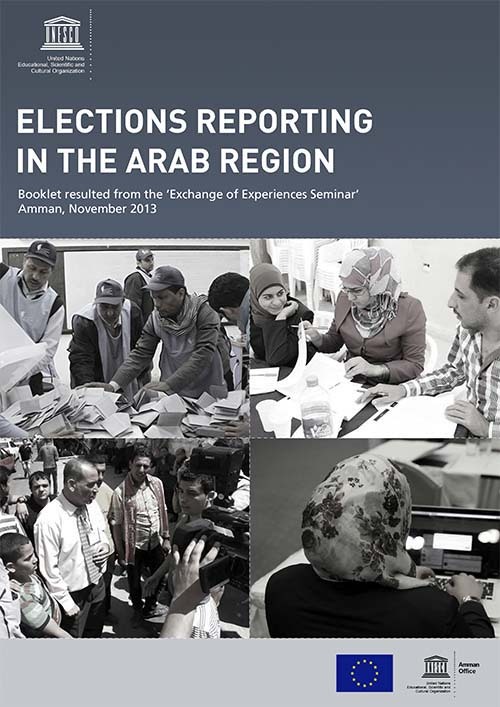 The booklet entitled “Elections Reporting in the Arab Region” [PDF] is a handy collection of articles encapsulating the proceedings of an experts meeting in Amman, Jordan during which participants exchanged views on how the media tackled elections in their respective countries. The seminar in November 2013 grouped Jordanian journalists who had attended training workshops on elections coverage with counterparts from Tunisia, Egypt, Lebanon, Iran, Palestine and Iraq who, in turn, had covered elections in their own countries as well as regionally and internationally. The seminar was funded by the European Union and organized by UNESCO’s Amman office. Keep it simple, don’t assume, remember accuracy, ethics are key, and avoid wordiness, was some of the advice provided by BBC veteran Jim Fish and Media Unlimited director Magda Abu-Fadil to 12 Georgian journalists attending a booster course to hone their reporting skills. 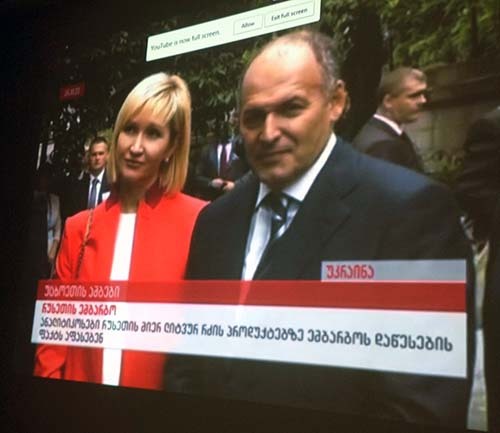 The reporters at print, broadcast and online media presented samples of their work in the final phase of training organized by BBC Media Action and funded by the European Union in Tbilisi. The reports included focus on a special needs school, internally displaced persons, the decriminalization of marijuana, homeless senior citizens, victims of hurricane damage, and an embargo on dairy products, to name a few. Fish and Abu-Fadil cautioned the journalists not to be swayed by officials’ statements and to cut through the haze of government, corporate and NGO news releases. 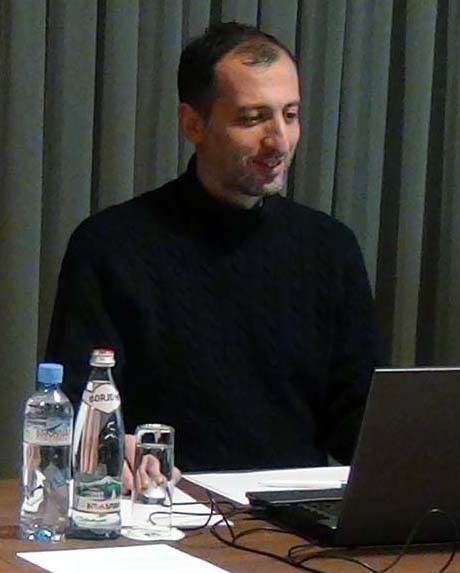 Akaki Gvimradze, deputy editor-in-chief of the Georgian daily “Resonance,” helped with logistics and served as a mentor to the younger journalists. While most of the three samples each journalist produced were of a serious nature, a few TV reports touched viewers’ funny bone and provided a fresh approach to otherwise mundane subjects. 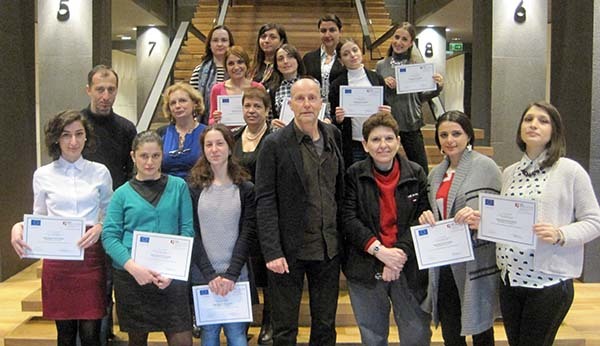 The intense two-day course in January 2014 is part of a series of workshops covering partner states of the European Neighborhood and Partnership Instrument, an initiative that targets several Eastern European and Mediterranean countries. 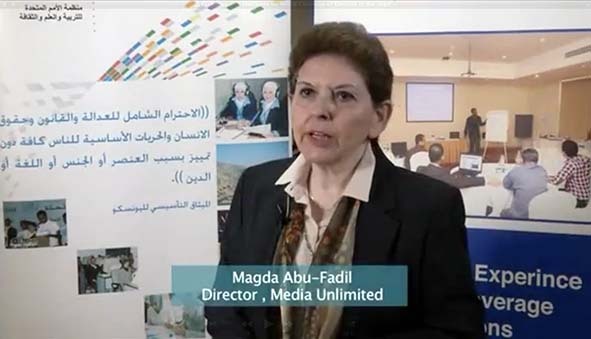 Political polarization and political sectarianism are the main problems facing journalists covering legislative elections in Lebanon, Media Unlimited director Magda Abu-Fadil said in an interview. 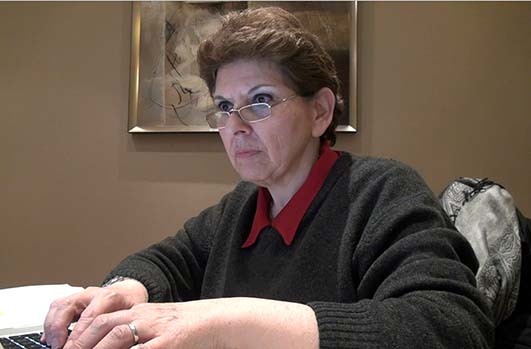 “There are always warnings about crossing red lines, as that may endanger life and limb,” she said, adding that threats may also affect the direction of reports that are published or broadcast. 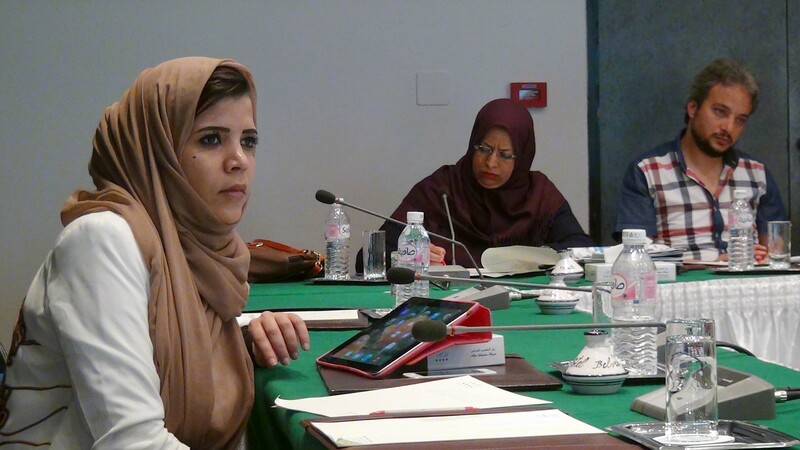 Abu-Fadil addressed an experts meeting in Jordan on challenges facing elections reporting in the Arab region funded by the European Union and organized by UNESCO‘s Amman office. 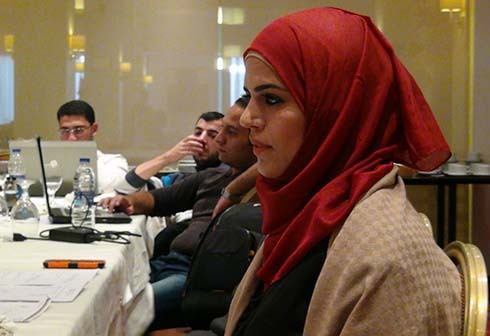 Fourteen Jordanian and Palestinian journalists sat through two days of intensive evaluations in Amman, Jordan where experts judged their print, broadcast and online output for various media as a follow-up to earlier training workshops. 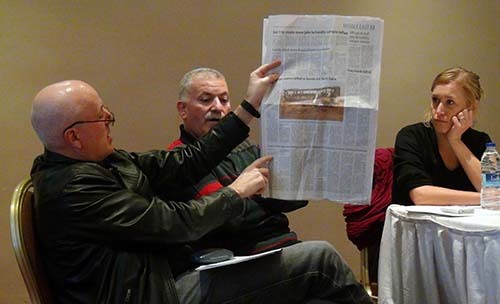 The November 2013 workshop aimed to improve participants’ reporting skills in covering topics such as the Israeli occupation of Palestinian lands, a popular movement to set up tent cities where Israeli settlements are being planned, child labor in the Jordan Valley, and Jordan’s handling of Syrian refugees,. BBC veteran and lead trainer Russell Peasgood provided solid advice on how best to prepare and present radio and television packages as well as reporting for newspapers. 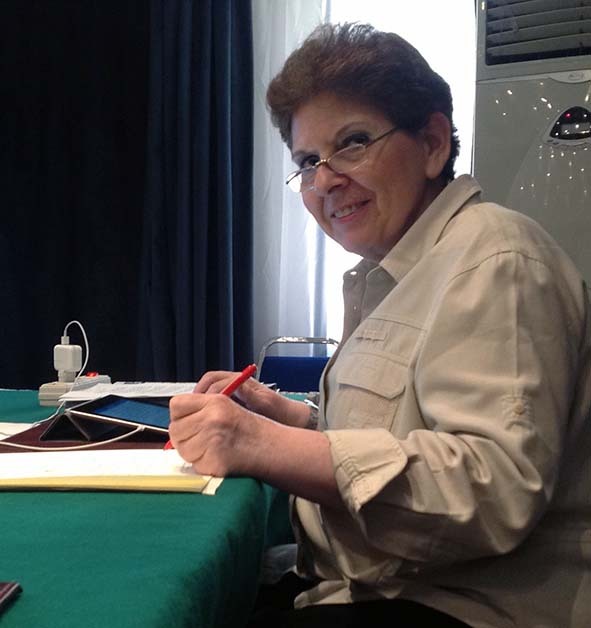 Media Unlimited director Magda Abu-Fadil contributed to the assessment sessions by judging print, online and broadcast content. Reports in Arabic and English also focused on Palestinian prisoners in Israeli jails, the commemoration of (Ard) Land Day, how the Israeli occupation distresses Palestinian children, restoration of Jordanian relics and historical sites, eco-friendly coal mining in the West Bank town of Jenin, as well as threats to the Zarqa second-hand market in Jordan. The workshop was part of a project funded by the European Union and delivered by a consortium led by BBC Media Action . Ethics came to the fore again – this time on the topic of violence against children and how much of it should be covered by the media. 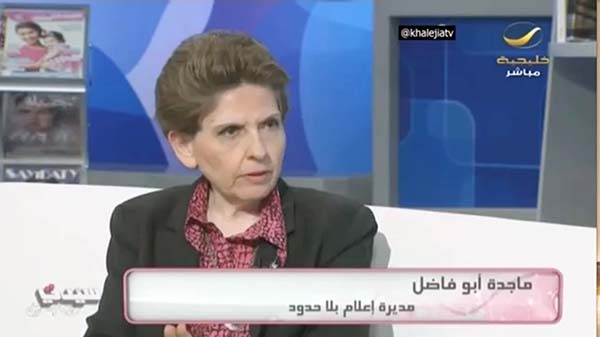 In an interview on the Rotana Khalijia channel’s program “Sayidati,” Media Unlimited director Magda Abu-Fadil stressed the importance of drawing red lines where children are concerned and urging media to abide by guidelines for good journalistic practice on issues related to violence. The show’s segment related the cases of the body of a naked child splashed on TV screens, a girl stricken with AIDS being visited by celebrities, and a boy whose parents abused him. Abu-Fadil said it was important to create awareness through the media about such incidents but that it was equally critical to ensure that one does not cross that very fine line between reporting and sensationalism. “Sayidati,” co-hosted by Saudi presenter Maysaa Al Amoudi, is broadcast live from Abu Dhabi and Saudi Arabia.